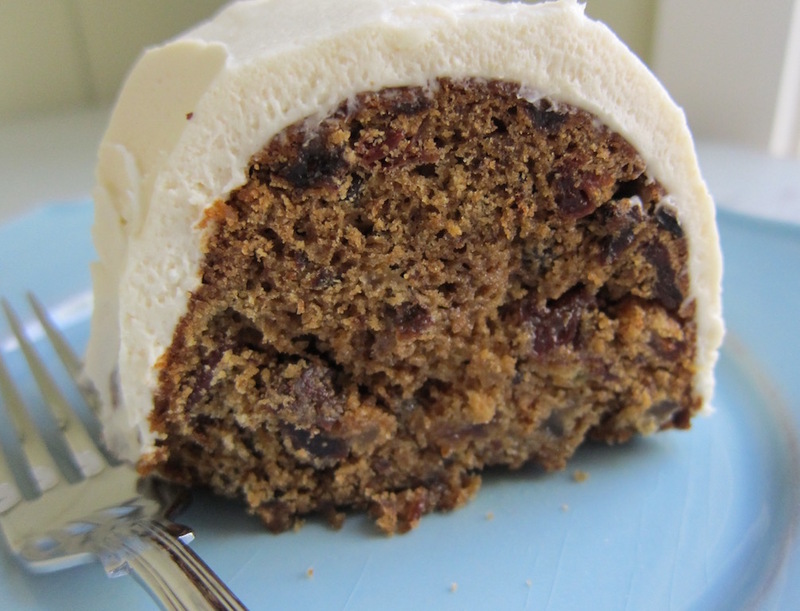 Dark and spicy Christmas Pudding Cake marries updated holiday fruit cake to carrot cake frosting. 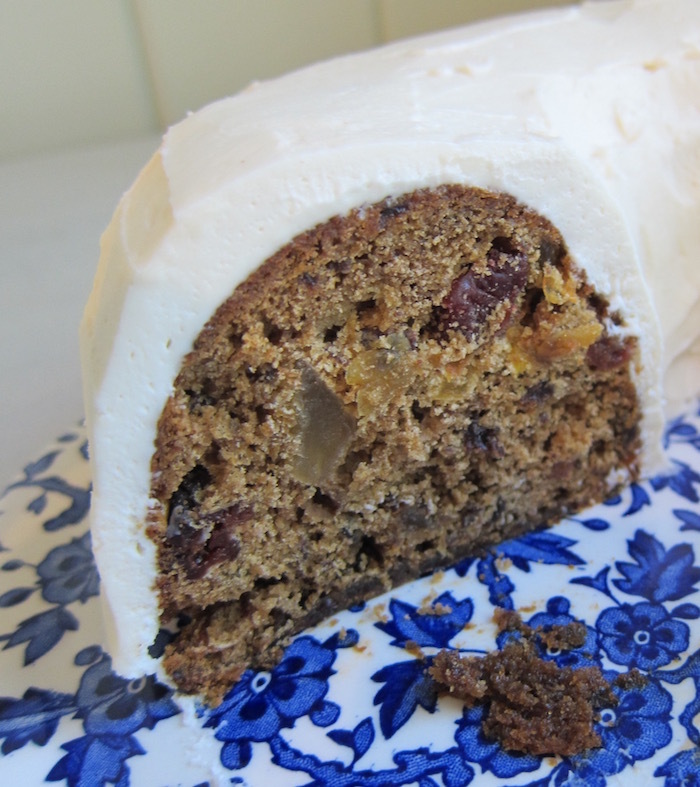 This is not your mother’s fruit cake! Baked in a ring, and coated with cream cheese frosting, my Christmas Pudding Cake has a festive “snowy wreath” look. I call this Christmas Pudding Cake because it contains pureed ‘fresh pack’ plums à la English steamed plum pudding. I first created the recipe for a magazine article on quick breads. My weekly visits to the health food store led me to update and revive it now because the bulk bins there offer such a wide selection of natural dried fruit like sour cherries and currants, along with low-sugar candied pineapple and papaya that aren’t overly sweet. The diced fruit gets an overnight soak in a small amount of Grand Marnier — French orange brandy — which plumps it up and adds a wonderful undertone. Alcohol in the brandy evaporates as the cake bakes. The mix of dried fruit includes white and dark raisins, cherries, currants, papaya and pineapple which all take on an orangey flavor during maceration. 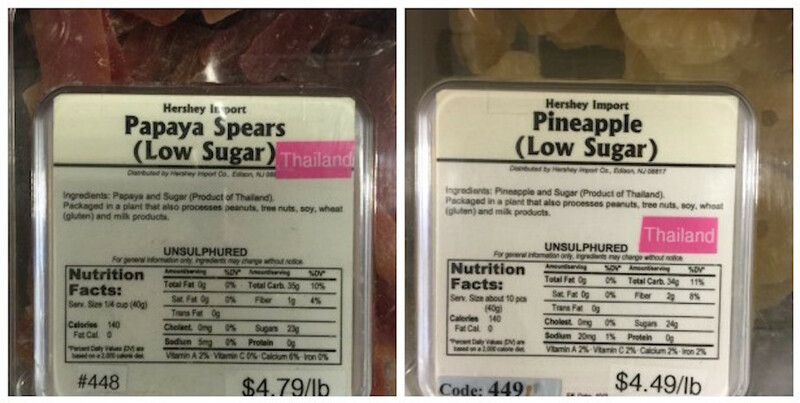 Pineapple and papaya bin labels were helpful to know I wasn’t getting any awful old-fashioned sticky dried fruit. And there’s nothing green in here. 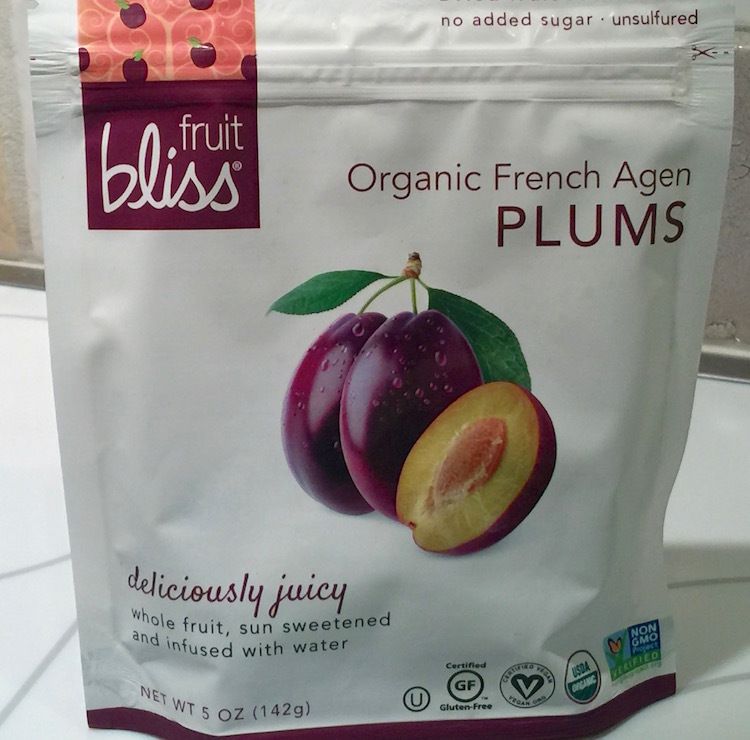 A 5-ounce bag of fresh-pack plums (plums are prunes) should yield the 1/2 cup of puree needed to help moisten the cake. These are also available at the health food store. When mixing the dry ingredients and macerated fruit into the batter, the flour goes in first with the fruit over it. They get stirred together very slowly. A dark batter gets its mahogany color from the combination of brown sugar and molasses. The best way to even it out in the pan it to put several cloth towels on the counter and then thump the pan down several times on the towels to even out the batter, as I explain in the recipe. 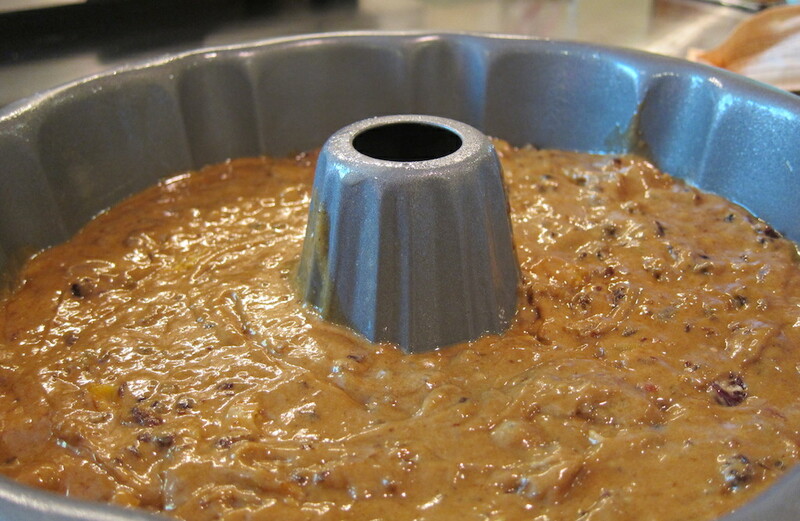 That way the cake will sit flat when unmolded. The cake keeps well for several days, which can come in handy during the holidays when family and friends are in and out. One to three days ahead, cut any large pieces of fruit into 1/4 inch dice. Transfer all the fruit to a 1 quart container with airtight lid. Stir in Grand Marnier. Let stand overnight or as long as 3 days, turning or stirring occasionally. Adjust oven rack to lowest position. Heat oven to 300 degrees. Coat a 12-cup bundt pan with non-stick spray; set aside. Puree the plums and measure 1/2 cup for use in the cake batter (set any remainder aside for another use). Grate the lemon rind; reserve lemon for another use. Sift flour, baking powder, cinnamon, allspice, nutmeg and salt; set aside. In an electric mixture with the flat paddle attachment, beat butter until smooth. Slowly beat in white and brown sugars until evenly incorporated. Then beat in the molasses, eggs, the pureed plums and the oil. Put half the flour mixture over the batter in the mixer bowl. Put lemon rind and half the fruit mixture on top of the flour. Stir in just until combined. 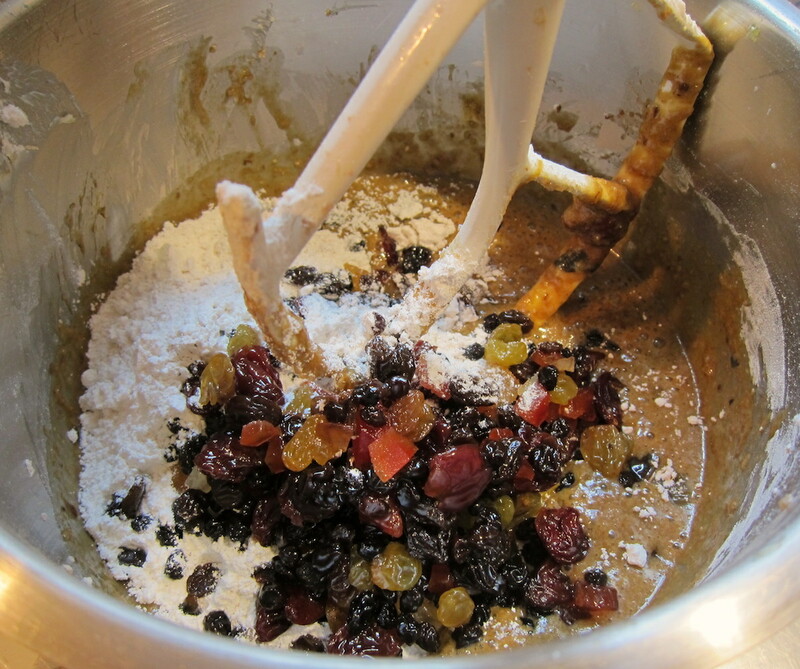 Add remaining flour then the remaining fruit mixture, stirring on lowest speed just until evenly combined. Pour batter into prepared pan. Spread two dish towels on the counter or another hard surface. Level the batter in the bundt pan by rapping the pan 3 or 4 times on the towel. Bake until a cake tester or bamboo skewer inserted into the center of the loaf is withdrawn clean, about 45 to 55 minutes. Cool 2 hours and turn cake over onto a serving platter. Cool to room temperature. If serving plain, dust with powdered sugar. Or cover with cream-cheese frosting. Cut cream cheese and butter into chunks. Beat together r until smooth and fluffy. Add vanilla and beat slowly until absorbed. Working with about 1/3 cup sifted sugar each time, add it to the cream cheese mixture. Beat slowly until absorbed then beat on highest speed for about 1 minutes. Repeat to add all confectioner’s sugar and the frosting is smooth and creamy. Use at room temperature to frost the cake. Bundt pan - This shape is perfect for a Christmas cake as it’s similar to a wreath. The recipe uses a standard 12-cup bundt pan which I coat with olive oil spray and wipe out excess. Warm or cold? — This cake is lovely when it’s slightly warm. That doesn’t lend itself to frosting, just powdered sugar. Frosting or no frosting? - I think the cake gains flavor with the tangy cream cheese frosting. But it can go commando — just dust some powdered sugar on top. Other garnishes - If not frosted, slices of the cake go well with whipped cream, crème anglaise (custard sauce) or ice cream. Quick maceration - Cover diced dried fruit with 1/2 cup boiling water. When absorbed add 2 tablespoons Grand Marnier. Let stand 2 hours. Cake can be baked a day in advance, wrapped and refrigerated before frosting or serving. Grand Marnier - Dark rum can be substituted but add the grated rind of half an orange to the recipe. No liqueur - Cover the fruits in 1/2 cup boiling water. 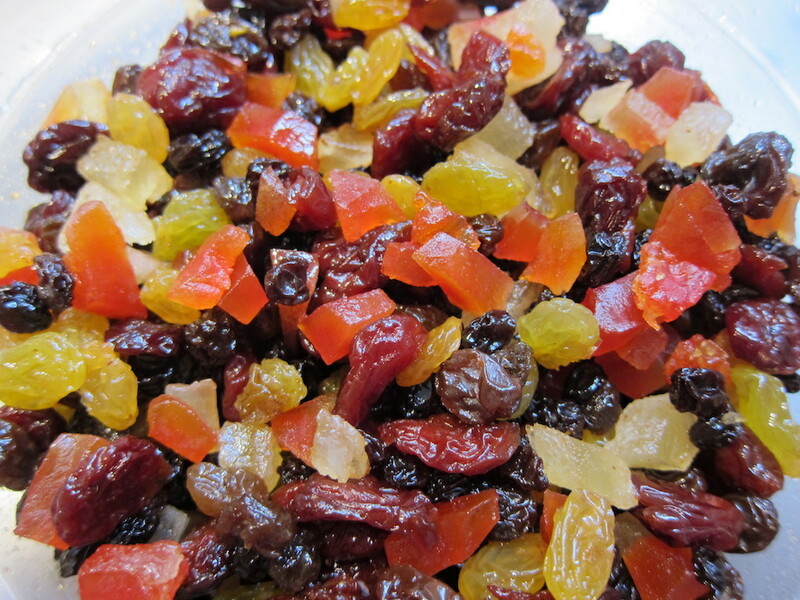 Dried fruits - 16 ounces of dried fruit is needed for the cake and individual dried fruits can be switched out. Apricots and strawberries are good options.